I firmly believe that my goal to ‘hack authenticity and open source it for all’ will have impact. People who are authentic do not rely on luck, they always have a system. In the context of these postings they have a method for hacking authenticity. Over the years they have developed a habit, discipline, worship, observance, act, practice and custom. The trick with this hack is to make it so easy that you have no excuses for not getting started right now. 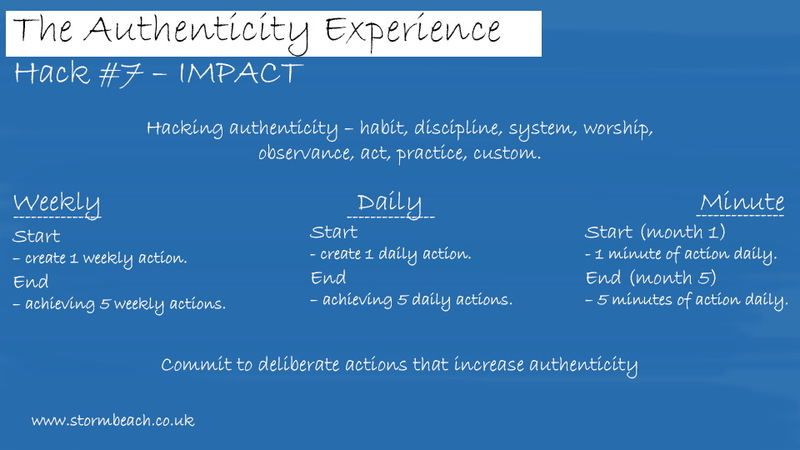 For example, after reading this posting choose an activity that you believe will lead to increased levels of authenticity. Then for the next month spend one minute a day working on this activity, even if you have the time and inclination to do more ensure you stop after the 60 seconds have passed. This keeps your goal realistic and you will want more. Then next month spend two minutes on this activity, increasing by a minute per month until you reach the level that is manageable for daily practice. 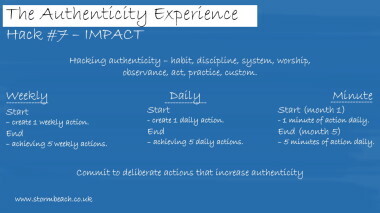 The weekly hack calls on you to create one weekly action, deliberate activity that increases authenticity. Perhaps stick to this for a month before introducing two weekly actions, and so on. If these conscious activities are to become a habit then daily practice is your ultimate goal. These might remain scheduled, or happen more naturally when your level of activity matures. You will notice in my work around personal energy I promote engaging in five activities a day that tap into the five energy sources of – soul, body, heart, mind, and spirit. Five months ago I knew that I had to incorporate more resistance work in my exercise and training plan. Movement and running in nature was always my key goal, so to incorporate this kind of discipline required me to start at the bottom. For the first month I committed to doing 10 press ups a day, and no more. Even after a couple of days I noticed a shift in my perception around resistance work, and that was based on doing a mere 30 press ups in the last three days! Each month was a challenge as I increased to 20, 30, 40 and now 50. For now I am sticking to 50, but interestingly this activity has now encouraged me to do a one hour resistance workout every week.